Sequestration of carbon (C) in soils is being promoted as a way to remove carbon dioxide (CO2) from atmosphere and lower the potential for global climate change. Cultivation typically resulted in the loss of 20 to 50% of the native soil C, because disturbance of the soil speeds the decomposition of plant residues and soil organic matter. Eliminating tillage and establishing perennial plant cover can return C to the soil by slowing the break down of plant residues and allowing a greater portion of the plant C to be retained as soil organic matter. The conversion of croplands to pasture usually adds 0.2 to 0.5 tons of soil C per acre each year. Converted soils generally accumulate C for 15 to 25 years then reach a saturation point where C inputs and losses are about equal. Maximum C content varies by soil series, but the root zones of pasture soils in the northeastern US seldom exceed 5% C (\~9% organic matter). Even when mature pastures are no longer sequestering new carbon, they are an important pool of stored carbon. 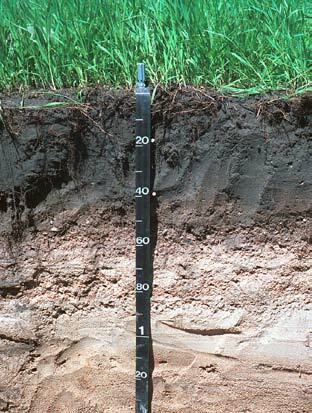 Pastures in the northeastern US typically contain 25 to 50 ton of C in the upper 1 foot of soil. With about 8.5 million acres in the northeastern US, pasture soils in the region store as much as 425 million tons of C (\~1500 million metrics tons of CO2). The potential to sequester additional C in mature pastures (>25 years old) is limited, because C levels are typically near the soil’s saturation point in well managed pastures. In pastures that have not been managed intensively, soil C sequestration can possibly be increased through management practices that increase plant biomass production (such as liming, optimal fertilization, pasture renovation, and improved grazing management). The addition of deeper rooted plant species also has the potential to increase sequestration by putting plant carbon inputs deeper in the soil profile. Soil carbon can be measured very accurately, but verifying changes in soil carbon over time requires extensive soil sampling. C content of soil can vary greatly within a few feet in the hilly terrain of the northeast. Spatial variation in soil C in a mixed-use watershed in central PA is shown below. At that location, it was shown that sampling at 30 ft or smaller intervals (with several sub-samples at each point) was needed to obtain soil samples that captured the range of high and low C values and accurately represented the average C concentration of a field. The labor requirement for sampling and analysis cost should be consider in the design of C credit programs if measured verification is required. Many carbon credit and marketing programs have been proposed, but the Chicago Climate Exchange (CCX) (http://www.chicagoclimatex.com) is the only organization currently selling soil carbon credits in the US. CCX, through registered aggregators, offers carbon credits for planting new pastures. The program assumes a sequestration rate of 1 metric ton CO2/acre/year (0.3 ton C/acre/year) for pasture establishment and does not require the landowner to measure soil C. Payment rates have ranged from less than \$1 to about \$5 per metric ton of CO2 (\~\$2 in Feb. 2009). To be eligible, pastures must have been established in 1999 or later. There are currently no programs that apply to older pastures. Establishing and maintaining pastures plays a valuable role in efforts to reduce atmospheric CO2 levels as well as contributing to the overall improvement of the environment. At current payment rates for C offsets, opportunities for income from soil C sequestration in pastures are limited. However if caps are imposed on CO2 emissions, much higher offset payments are expected to make soil C sequestration much more profitable.